If you've ever been the victim of unwanted intrusion, vandalism, or theft then you know the costs and the headaches that come with not protecting the physical security of your facilities. Having the right security command center could be what it takes to make all the difference. The Building Access System (BAS) uses powerful technology for control and regulation for entry point access and facility security. You don't want to waste your precious time setting up a needlessly complicated security system. Securing your facilities doesn't have to be an expensive and complicated task. Powerful, effective, and simple systems exist that save you time, money, and effort. What does it take to secure my facilities? Not much at all, in fact. At a basic level your security command center should keep unwanted visitors out and allow access to the right employees - the basic lock and key system. However, this sort of system is limited, and doesn't fully secure your facility. Physical keys are easy to copy and lost keys force you to change all of the locks. The right security system will do much more than the basics - without the extra hassle. A great security system will offer customizable access privileges. You want software that allows you to set specific access privileges for specific users. This gives you optimum control over which employees can access which buildings, during what hours, and on which days of the week. This optimally protects you from an "inside" job. Look for security systems that offer quality software to really give you the most control over the access privileges for your facility. The best security command centers won't put unworkable limits the number of users you can grant access. Only supporting a small number of employees puts a ceiling on what you can and can't do with your access privileges - so don't limit yourself. Your security center should give you plenty of support to allow customizable access to all of your employees. Don't let your security center limit your entry points or doors. Only a limited number of entry points means you don't really have control over your entire facility. The right system will give you plenty of support for all the entry points you need to guarantee the security of your facility. A quality security system isn't complete without the right monitoring accessories. Having support for motion sensors and IP cameras can really make the difference when it comes to keeping out unwanted intruders. It's crucial that your system to support motion sensors. Motion sensors can provide you with the intrusion notifications you need to ensure the security of your facility. IP cameras can trigger events and store images of what is happening. A quality IP camera will be capable of capturing a window of images from before and after the moment it is triggered. This allows you to view events before and after the triggering event, so you know precisely what is happening. Without the right support for accessories, your security command center is limited - and leaves your facility vulnerable. For a detailed guide on getting the right security command center solution download the FREE DPS Telecom Building Access System White Paper - your guide to protecting your sites with a cost effective solution. Where can I find such a powerful security command center? Complete access configuration so your employees always have the right access to where they need to be, when they need to be there. Motion sensor technology and cameras to provide 24/7 notification capabilities of unwanted visitors. Industrial-grade hardware so you don't have to worry if your security system has the reliability to guard your facility. Since you're ready for life with the right security system, I suggest the DPS Telecom Building Access System (BAS). 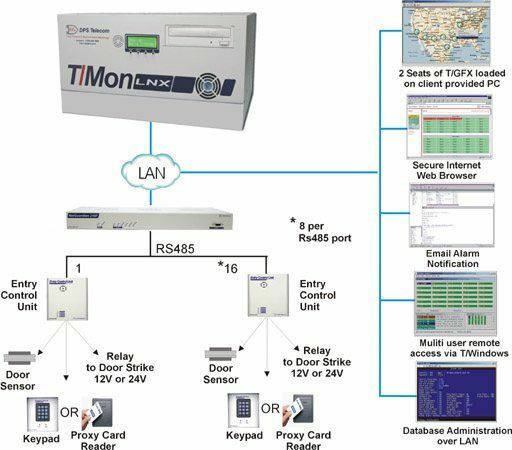 This system features the T/Mon LNX Master Station, the NetGuardian 832A G5 Remote Terminal Unit (RTU), the Entry Control Unit, and a Proxy Reader, with full support for infrared motion sensor technology and a SiteMON IP Camera. The BAS supports thousands of users and gives you control over 16 entry points via keycards with access configuration software. The BAS also comes with first-class 7x24 tech support - so you're never alone when monitoring your facility. The DPS Telecom BAS is the total package to guarantee the security of your facility. Don't leave your facility vulnerable to intrusion, vandalism, or theft any longer - call (1-800-693-0351) or email (sales@dpstele.com) the security command center specialists at DPS Telecom to get started protecting your business. It's 3:15 AM on Friday at our Fresno, CA, USA headquarters. It's early in the morning, but we'll start on your quote as soon as we get into the office.